Hearty, filling muffins for breakfast needn't be dry and dull. 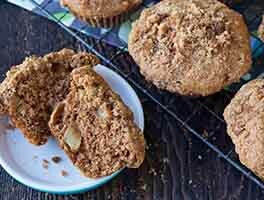 Bran muffins with loads of dry fruits and nuts, touched with the spices of your choice, can be moist and delicious. Even better, they have very little added fat or sugar, and just one egg. 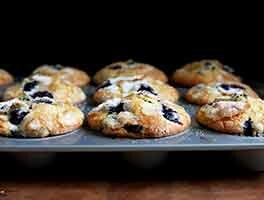 Smear a bit of butter or jam on a muffin, grab a hot beverage and savor a muffin on the way to work. Preheat the oven to 375°F. Grease (or line with papers) a 12-well muffin pan. Melt butter and syrup/honey together; reserve. Combine flour, bran, baking powder and spices in mixing bowl. Dissolve soda in milk, and beat in egg. Stir in honey mixture, fruit and nuts, then enough more liquid to make proper muffin batter consistency. Spoon batter the muffin cups and bake for 15 to 18 minutes. Store, well-wrapped, for 3 days at room temperature, or freeze for up to a month. Note: These muffins are easy to customize! Like a sweeter muffin? Substitute 1/2 cup brown sugar for the 2 tablespoons syrup/honey; you could also use 1/2 cup of any other sweetener. 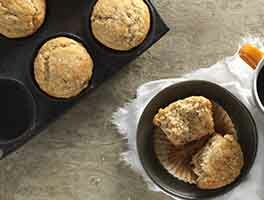 For a more tender muffin, use whole wheat pastry flour instead of our Premium Whole Wheat. 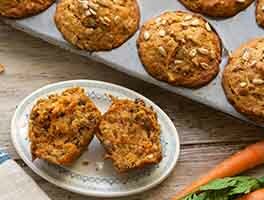 Raisins, currants, walnuts, chopped dates, chopped dried apricots, dried figs, dried cranberries, flaked coconut, sunflower seeds and most kinds of nuts are all good additions to this hearty muffin. Our thanks to author Lillian Marshall of Louisville, Kentucky, for sharing this recipe with us. Are the weight measurements off for this recipe? I made according to the weight (g) instructions and there was way way way too much wheat bran. I've never baked with wheat bran before and it looks liked it is very fluffy, so I wanted to stick with the weight measurements instead of volume. However, 213g of wheat bran was closer to 4 cups (although I didn't measure) and the resulting batter was dry. I had to add extra milk, as instructed, but the resulting muffins are dry and VERY wheaty. Oh my goodness, these muffins are delightful. I have to confess, I committed the ultimate sin and didn't check my fridge before I started baking, so I had to make some substitutions on the fly. I was out of milk, so I used canned coconut milk that I sweetened with simple syrup, and I replaced half the whole wheat flour with buckwheat flour just for fun. Also, I was out of butter, so I used shortening. I used half oat bran and half wheat bran just because I could. I realized at the last second that I was out of eggs, so I threw in a whole bunch of chia seeds just to bind it together. Oh, and I ended up using more coconut milk to get it to a batter consistency, so it ended up being sweeter than normal, but it turned out beautifully. I love this recipe! I used 1 cup each oat and wheat bran and substituted pure maple syrup for the honey. I added 1/4 cup applesauce and stirred it in the milk before adding wet ingredients to the dry ingredients (to avoid over stirring the batter by adding the applesauce later.) Dried fruits I used were apricots, coconut, dates, cranberries and cherries. Spices were cinnamon, ginger, and a smaller amount of nutmeg and cloves. 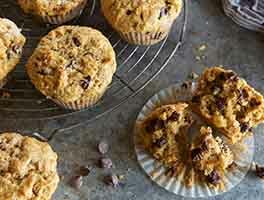 It made a flavorful hearty muffin that is full of nutrients but not too sweet. This recipe can be easily changed by using different dried fruits, nuts, and spices. Great recipe to modify based on your tastes! Used a small can of drained crushed pineapple (instead of dried fruit), but added about half of the liquid back to add moisture to batter. Used half oat bran/half wheat bran and added 1 tsp vanilla. When I initially read this recipe I noticed how it mentioned after adding the fruit/nuts that if it was too dry to add extra liquid. Knowing that you shouldn't stir muffins much so that they don't become tough, I was careful when adding extra milk to not stir much more. I ended up adding 2 more tablespoons of milk and they really needed a third tablespoon. They were still a little dry. I will make these a 2nd time and automatically add the extra liquid up front so that I don't have to worry about over stirring. I added 1/2 walnuts, 1/2 cup dates, 1/2 cup dried cherries and 1 tsp of cardamom. dont be shy with the spices. The heartiness of the bran can take some spice. Turns out that I was nearly out of whole wheat flour and mostly used white wheat because of that. I really appreciate the healthiness of the recipe. Even with them turning out a little dry (yes I weighed my ingredients) and not so good to just eat out of hand, I crumbled them over a bowl of yogurt & fresh fruit and it was a perfect way to save them from the trash bin. Thank you for the healthy recipe. I try these again and add extra liquid up front. Healthy & delicious! Not sweet at all. I enjoy toasting them in the morning and pairing with yogurt & honey. Thank you! What is 'baking' bran? Is it a special type of bran? Can I just use regular oat bran, where the label doesn't mention 'baking'? Love this recipe! 1st time out, took your suggestion of 1c. bran, 2c. flour and used White Whole Wheat. Used the 1/2c. brown sugar, golden raisins, walnuts, and added Cinnamon Flav-r-bites (I'm just learning to use them) to the milk (used buttermilk). For spice, used cinnamon, some nutmeg, and a bit of salt. Was very pleased with the result. Will try only 1/3c. brown sugar and maybe some unsweetened applesauce instead of extra buttermilk next time. That will be tonight for 2 reasons: Just got in new KAF muffin pans that MUST be tried out... and when I was out, the dog pulled the bag of 6 leftover muffins from the counter AND ATE EVERY LAST ONE!!! 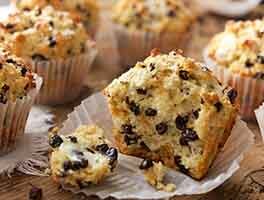 I love this recipe, the muffins are very healthy and full of fiber! One or two muffins keeps me feeling full for hours. I do add additional applesauce or they come out a little dry and crumbly. I like to spread some fruit preserve on them, as they aren't very sweet on their own.